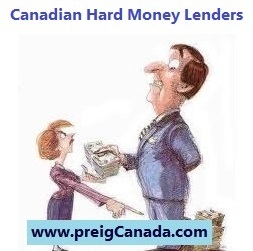 Canadian Hard Money Lenders lend on short term basis on an investment properties. Loan to value ratio shall not exceed 60%. Instant funding available provided all information is provided. Canadian Hard Money Lenders is a specific type of asset-based loan financing through which a borrower receives funds secured by the value of a parcel of real estate. Hard money is similar to a bridge loan, which usually has similar criteria for lending as well as cost to the borrowers.